1. An editorial cartoonist often uses humor to illustrate a news item. Occasionally a cartoonist will use a news item to illustrate an entirely different point. In his cartoon below, Jerry Holbert uses irony to illustrate an issue that aggravates many Americans. (Irony is defined as when the opposite of what you expect to happen occurs.) Describe the irony in this cartoon. 3. a) Do you agree with Mr. Holbert? Explain your answer. 1. 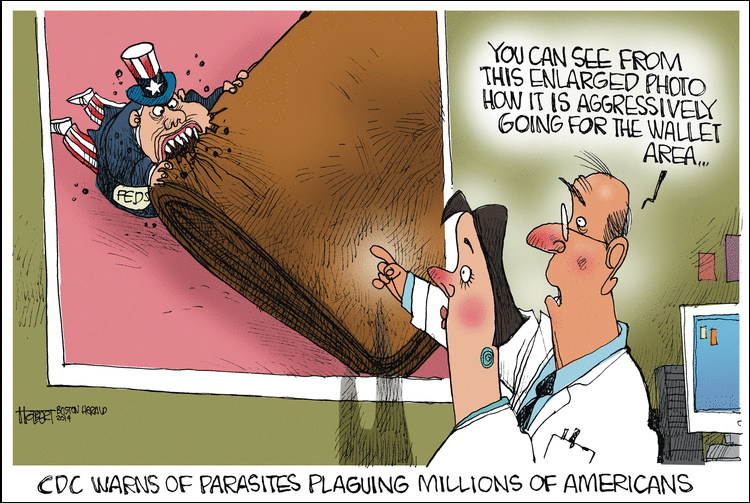 When you read the headline “CDC Warns of Parasites Plaguing Millions of Americans,” you would expect the cartoonist to make a point about the CDC (Centers for Disease Control) warning on parasites. Instead, he uses this news story to illustrate his thoughts on the federal government, illustrating that it is a parasite on the American people’s wallet. 3. a) Opinion question. Answers vary.